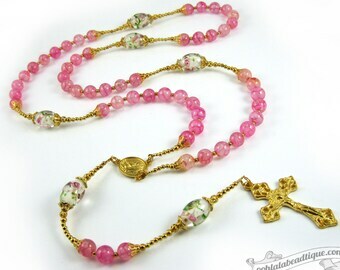 The handmade unique Orange rosary is inspired from the traditional Catholic Five decade Rosary Design. 8mm "Hail Mary" orange fire polished Czech glass beads are paired with large white "Our Father" porcelain beads, which are hand painted with orange floral design. Finished off with gold centerpiece with Virgin Mary on one side, Sacred Heart of Jesus on reverse. and gold plated Passion Crucifix. The rosary is strung onto tiger's tail wire for strength, durability and drape. The Orange rosary folded is approximately 20 inches long. The gold plated Passion Crucifix is approximately 2 inches long including the bail. The Passion Crucifix has sharpened points at the end. It is also referred to as the Cross of Suffering symbolizing Christ anguish at his Crucifixion. The upper three short sections of the Passion Crucifix represent the three nails, and the lower pointed stem represents the spear that pierced Jesus' side. Three arms of the crucifix are decorated with a vine leaf, reminding us of the Christian’s union with Christ. In John 15:1-3, Jesus calls himself the vine, and that Christians are the branches of that vine. The fourth arm is decorated with a rising dove above Christ' head, representation of the Holy Ghost. Orange colors symbolize courage, endurance and strength representing fire and flame. Orange is an alternative liturgical color used for Feast of Saints Peter and Paul until Transfiguration. 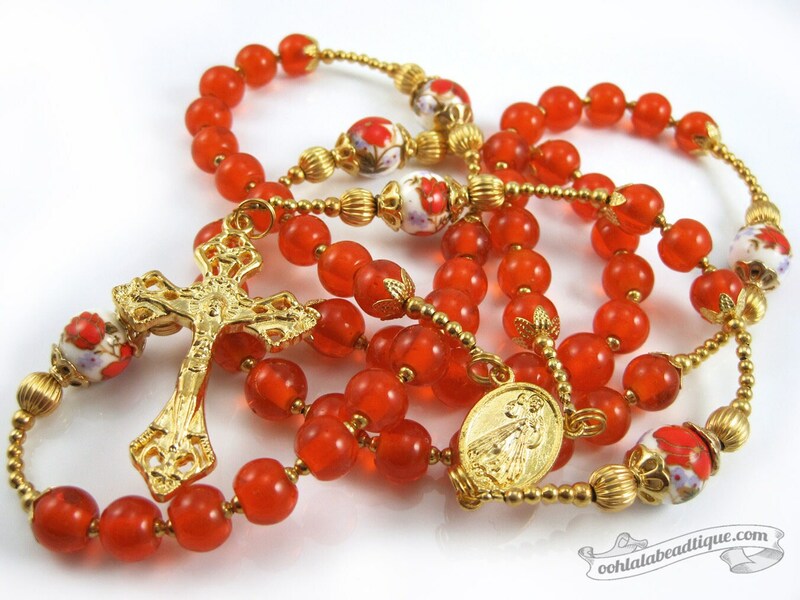 The Orange rosary will then be shipped to you in a padded mailing envelope. Package will include "How to Pray the Rosary" Card. Many Ooh-la-la Beadtique handmade products are crafted using natural components such as semiprecious stones, freshwater pearls, and wood. No two materials in nature are alike. 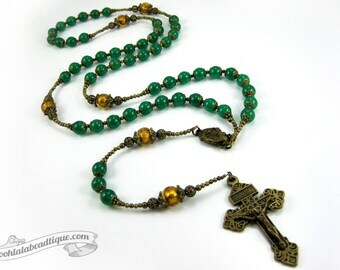 The handmade Orange rosary that you will receive may slightly vary in shade and texture pattern from the picture listing. Also note, that all monitors and computer screens are calibrated differently. The same product may appear in diverse colors on different monitors.